Book review: On Not Losing my Father’s Ashes in the Flood by Richard Harrison. the rain could not wash away…. Book review: The 2016 Long Lunch/Quick Reads Anthology, edited by Lisa Murphy-Lamb et al. “Book Review August and Possibly Part of September” doesn’t really have a zippy ring, but here goes…. I should note that all of the books I’m going to post about over the next few weeks have been read in the past year and a half, and there is quite a eclectic jumble of genres, audiences, etc.. If you’ve been following Flowery Prose for a while, you’ll already know that my reading tastes are pretty wide-ranging. I hope there will be something here that will pique your interest! The Door is Ajar: Yes by Rosemary Griebel. A few years ago, I set out all eager and full of abundant ideas and started oh about five blogs on WordPress, nearly all of which have, over time, become encapsulated within Flowery Prose. I’ve hung onto The Door is Ajar, which, for those of you who haven’t subscribed to it, is an ongoing list of books I’ve been reading and a super brief commentary about them – not usually what I would consider entire reviews, because that requires more time than I have. At any rate, I have finally made the decision to amalgamate the two blogs here. After all, books and writing and reading are a big part of Flowery Prose…and while I’m a bit afraid that some of you may be put off by my eclectic reading tastes, who knows? – this might just go over nicely in the end. I just really feel the need to streamline the whole blogging process and get everything (bad pun alert) on one page. I won’t completely shutter the site of The Door is Ajar, but I won’t make any new entries for the foreseeable future – click here if you want to pop over and see what I was doing. I’m not sure how many of these poems from Rosemary Griebel are autobiographical but her incredibly powerful portraits of parents, lovers, and friends, the prairie landscape of childhood, and journeys to Europe and other regions of Canada (as well as some interesting and bold reimaginings of history) feel so personal and intimate I don’t want to believe otherwise. I first selected this collection because Griebel is from Calgary, and although many of the poems were attractive to me due to that shared geography, I became far more emotionally engaged than I had anticipated – these are lines and stanzas that will bring tears to your eyes and make your stomach twist over, more than once. Unexpected and absolutely beautiful work. I haven’t posted one of these roundups in a few months (to say it’s been an insanely futile effort to get anything done busy lately is a massive understatement), but I’m always coming across interesting things to share, and I’ve been saving up links from a bunch of sources. Hope you enjoy this collection! This amazing photography technique using UV light takes floral imagery to new heights – check out the breathtaking work of Craig Burrows here. Granted, winter is officially over in the northern hemisphere, but it’s still well worth it to watch these jaw-dropping video timelapses of frost and other wintry occurrences, shot by Danish filmmaker Alf Pilz. The 51st American football (NFL) championship game is also a done deal, but I love this fun post by Alys of Gardening Nirvana so much I have to share it: click over and enjoy The Super Bowl of Gardening. I was not previously familiar with the poetic form the Etheree, but this beautiful offering from Linda of The Task at Hand is a perfect welcome to spring. Very early in the year, the Canadian Broadcasting Corporation (CBC) posted a collection of fascinating and funny wildlife photos from northern Ontario – you can take a look at them here. There is a link at the bottom of the page which takes you to the CBC Up North Facebook page and more pics. My very short story “Gardening in a Post-Apocalyptic World” is included in Third Flatiron Publishing’s newest anthology Principia Ponderosa. “The Forest Formula,” my article about designing forest gardens, is featured in the Spring 2017 issue of Herb Quarterly. The Spring issue is at the printers right now (and I have an article in it as well! ), but “Grow Delicious Microgreens Indoors This Winter” was published in the Winter 2017 issue of Archive, a fantastic new print magazine out of northern Alberta. Enjoy the start of your week! 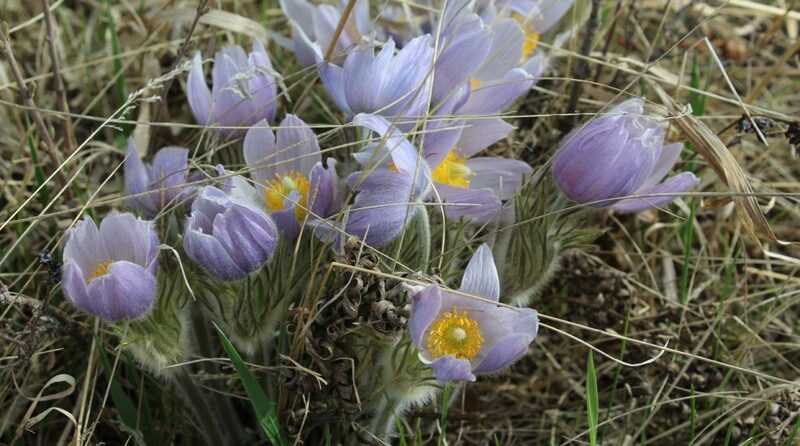 It’s finally starting to look and feel like spring here in Calgary! Many years we still have a lot of snow on the ground and winter-like temperatures in late March, but we are super fortunate this year and my hubby and my brother and I were delighted to get out on the golf course this afternoon. Temporary greens, of course, but it was so great just to soak up the sunshine and play! I love this time of year! For last year’s words belong to last year’s language, and next year’s words await another voice. And to make an end is to make a beginning…. The field featured is almost in Alberta – it’s actually in Saskatchewan, at a place called Alsask (fitting, if lacking originality). I initially thought that Alsask was like Lloydminster and Cypress Hills, and was partly in Alberta and partly in Saskatchewan, but apparently, only the former village’s cemetery is in Alberta. Alsask was the site of a military base between 1959 and 1987 but it no longer even holds status as a village; rather, it is considered a “special service area” incorporated within the nearby town of Milton. I rather wish we had stopped to explore; according to Wikipedia, most of the original buildings are gone, but one of the military radar domes and an indoor swimming pool (used in the summer to this day!) are still there. 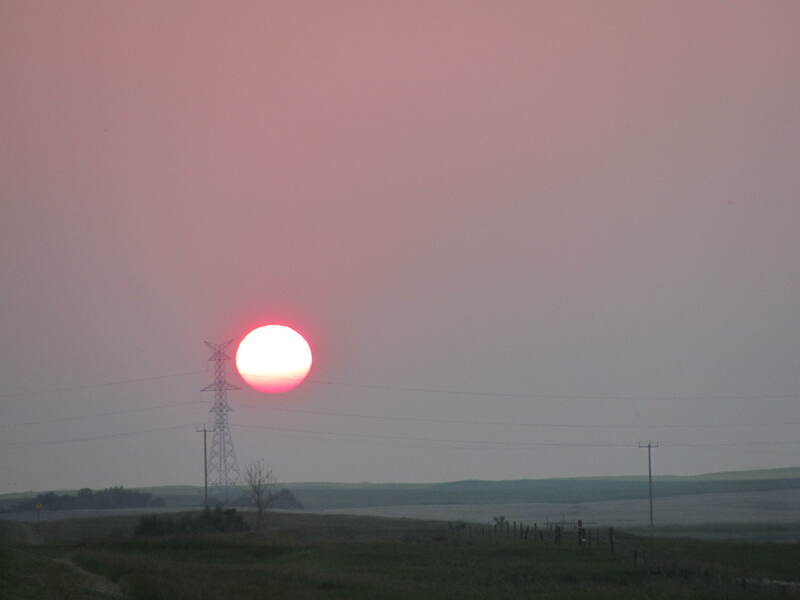 Forest fires were burning throughout Alberta and the Northwest Territories at the time, so the smoky air lent an eerie glow to the sun. I just loved the way that power lines looked against the sky; there’s something vaguely alien about the landscape to me, it’s a bit like something out of a science fiction novel. Speaking of novels, what is currently on your reading list? Anything that stands out for you – fiction, non-fiction, poetry, whatever? I’m dividing my time between several excellent cookbooks (including Karen Solomon’s Asian Pickles, and Small Adventures in Cooking by James Ramsden) and Kimberly Elkins’ debut novel, a fictionalized account of the life of Laura Bridgman called What is Visible?. (I’m barely into it but it’s captivating so far).